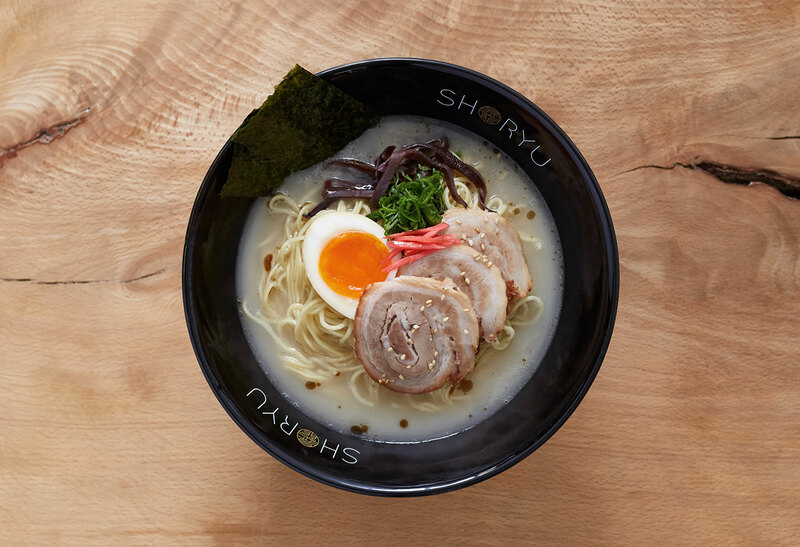 Our Hakata tonkotsu ramen recipe has been specially created by Executive Chef Kanji Furukawa who was born and raised in Hakata. 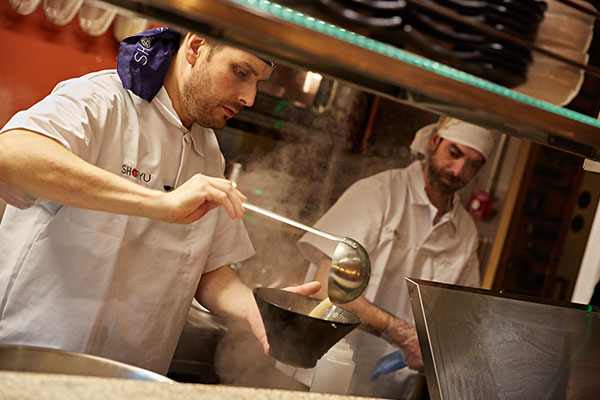 His recipe provides the UK with highly crafted, genuine tonkotsu rarely found outside of Japan. Perfection comes from our special blend of noodles, umami rich soup and toppings. Creating rich and creamy tonkotsu pork stock is a labour of love. 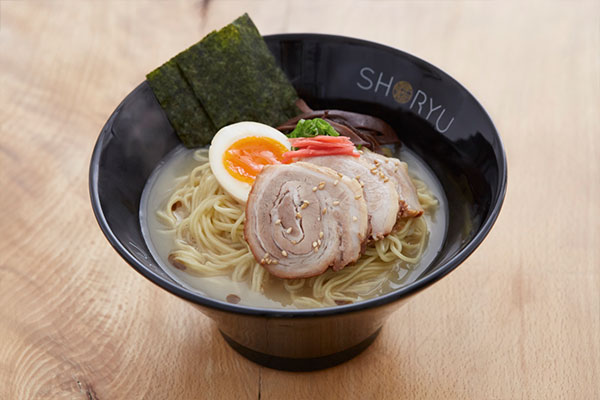 Each bowl takes over 12 hours of cooking at a constant boil to form enough collagen, fat, marrow and calcium to emulsify perfectly, turning it opaque into the famous white tonkotsu broth we all know and love. The stock is then combined with secret motodare, a concentrated base of ingredients to create the final soup. Our motodare is made using the best soy and spices from Japan. Not only is the perfect soup required but the right noodles are vitally important for Hakata tonkotsu ramen. The noodles must be thin and straight with plenty of bounce and chew. 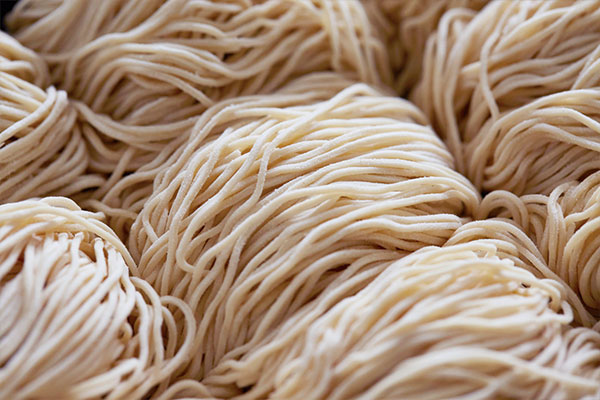 We worked extensively with a Japanese noodle-making master, using exclusive Ramugi Ichiban flour milled in the Fukuoka Prefecture to create the perfect original ‘hosomen’ thin noodle for our ramen. Don’t forget you can choose how you like your noodles - standard, hard, very hard or submerged briefly to remove the noodles flour dust. The final element which finishes off every bowl of ramen are the toppings. We use Burford Brown eggs to make ‘nitamago’, our soft boiled eggs with rich, orange, gooey yolks marinated overnight in soy, mirin, sake and ginger. Quality pork belly slow simmered for 4 hours in soy, mirin, sake and sugar make up our char siu barbecue pork and caramelised black garlic from Hakata known as ‘Mayu’ is also added to give a rich umami tone to our ramen.